AMSET recently acquired a new mixed media sculpture from collectors George Morton and Karol Howard. 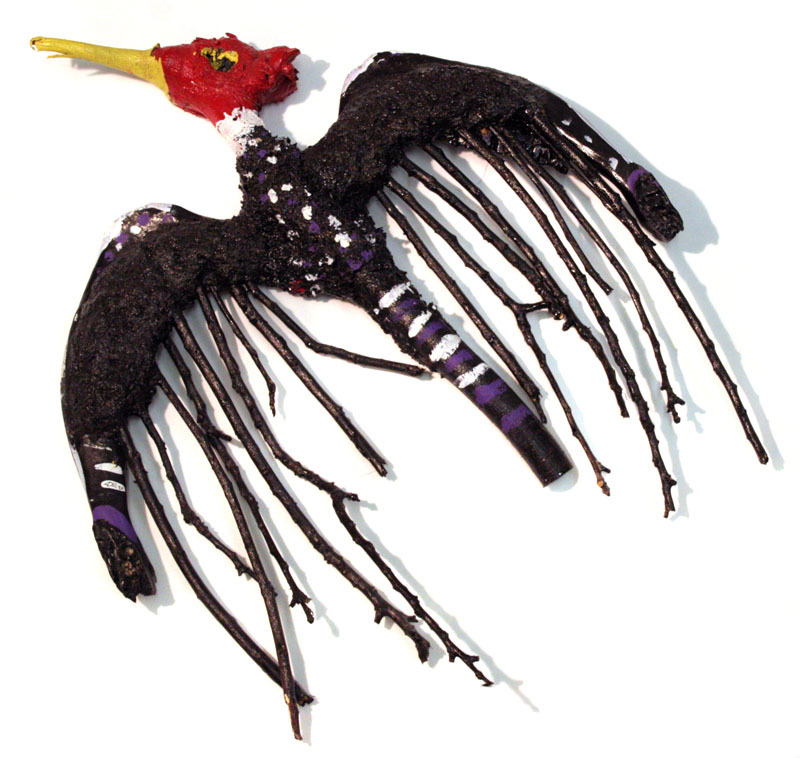 Woodpecker by Andy Don Emmons, a Texas contemporary folk artist, was created in early 1994; the piece is made of bone, tar, wood and paint. Emmons was born on September 8, 1966 to a family of 5th generation farmers and ranchers in Central East Texas. Inspired by the tall tales of his family, friends and foes, he began drawing, sculpting and painting the skewed world around him. He left Fairfield to obtain a bachelor of fine arts from Sam Houston State University. He lived in Dallas and Waxahachie before returning to his ranching roots in Fairfield a few years ago. The journey in between had many highlights including befriending the well-known folk artist Rev. Johnnie Swearingen from Brenham, Texas. He grew so attached to him that upon the passing of Swearingen’s wife, Andy moved him into his home to care for the aging artist until his death. They painted alongside each other for several years. Upon moving to Dallas, Bob Wade took an interest in Andy and he became his unofficial protégé for a period of time. He went on to exhibit his work all over Texas and had shows in other cities including New Orleans, Chicago and beyond.